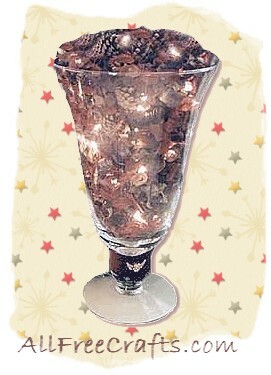 With a potpourri base in a glass vase, this project is inexpensive and easy to do. For a small vase a string of about 35 mini-lites will work fine, but you can use as many lights as necessary. This vase is quite large and holds a set of 50 lights. These are very easy and quick to assemble. Place your strand of lights in the vase leaving the end that connects to the outlet hanging out of the top and over the top edge. Place a little potpourri in the vase and move your light strand around the glass filling with potpourri until your vase if full. The arranging of the lights will take a little time, but these vases look spectacular when completed. Keep your lights close to the glass, as the lights buried within the centre of the potpourri will not show through. To add a little extra to the vase, I cut a small strand of velvet ribbon, glued a small angel button to the centre of the ribbon strand and attached the ribbon to the vase with a little dot of hot glue. The hot glue will easily remove from the glass, when the time comes. These not only look spectacular when all the lights are glowing, they smell fabulous for the holidays too. The heat from the lights help to intensify the scent and, for the Christmas season, I alway use a Christmas or Pine blend of potpourri. » Treat this pretty vase as you would a candle. Do not leave these unattended while the lights are on and always unplug from wall socket when not in use. I have made several of these and have had one set of lights malfunction. They did not catch fire or smoke, but they could have – please so take care when burning these.